I’m so glad you asked, but first, let me tell you a little more about myself. Hi (insert vigorous wave here) I’m Sophia Antoine. If you watched the Welcome Video, you were introduced to my unconventional way of doing things. If you haven’t watched the video, I will gladly wait while you do. Well, go on. I’m waiting. So, how was it? Do you understand where I am coming from? I am so over pretending nothing is wrong. When someone asks me how I am, I will no longer give the politically correct answer “fine”. What I will give you is truth. I will assure you that you’re not alone. I am tired of just “getting through” life and I want to start living without fear of judgement. Of course, there WILL be judgement, but there will be NO fear. 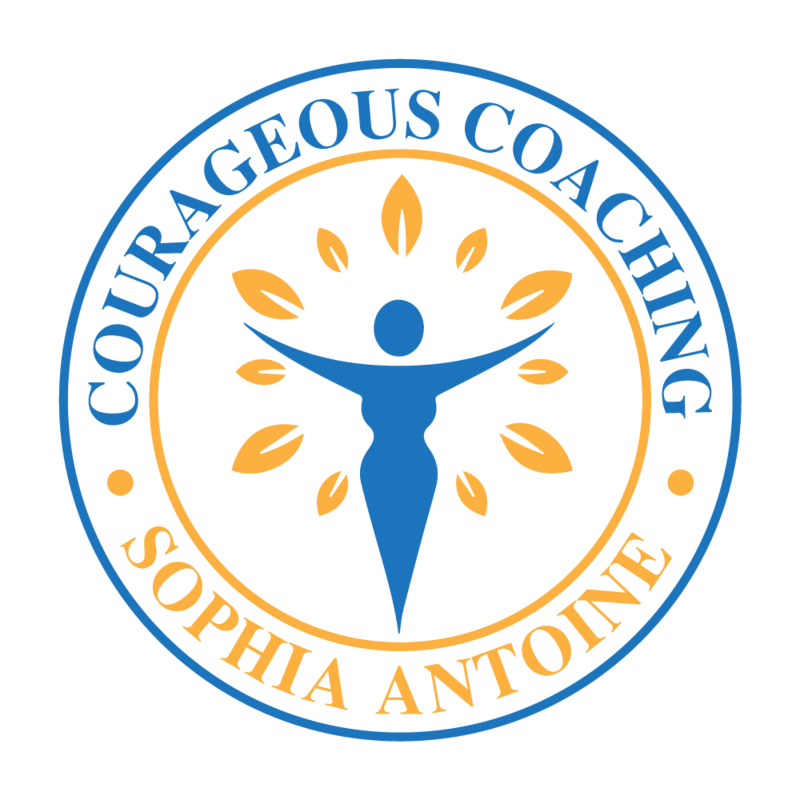 I became a coach to encourage + support women who have been traumatized emotionally, women who want to make positive changes in their relationships, and stop putting their feelings on hold to make other people feel comfortable. The time for that has passed. It’s time to do something different. Listen, I am not saying that you should pack up, quit your job, and backpack across Europe because you didn’t get to do it in high school. Let’s stay realistic. This is the essence of Courageous Coaching. Women spend so much time holding back. The sad thing is we have no one to blame but ourselves. Hold on, hear me out. You are a wife. You are a mother. You are an employee. You are all things to all people except yourself. Somewhere, you forgot about yourself. When you dare to dream of doing something different, you talk yourself out of it. You end up scaring yourself deeper into a rut. When I decided that the rut was no longer for me, I had no idea where to start. My husband was super supportive. He encouraged me to explore any and everything my mind could come up with. I am blessed to be married to such a wonderful man. I also realize that everyone doesn’t have that. I want to be your personal cheerleader. I want to help you renew your confidence, find your mojo, and get your groove back. You know….all those fun move clichés, but in real life. I want to help you unleash your inner BADASS. So, what will you when you come to the blog? A new post every Wednesday morning – I have so many tips, tricks, and rants to share. I couldn’t possible keep them all to myself. I may post more than once a week, but you’ll definitely see me on Wednesday. Be sure to sign up to get the posts delivered directly to your inbox. Content that matters – I won’t bombard you with fluff or crap. I really want to help women be who they aspire to be emotionally. Hard Work + Hustle – Some posts will challenge you to be a better version of yourself. There are habits that you need to change and boundaries you must establish. Fun + Foolishness – We are gonna do the hard work of getting ourselves together, but we won’t always be serious. We are gonna laugh and have a good time doing it. I know what you’re thinking because I would be thinking it too. You knew there was a catch, right? Well, not so much. All I ask is for you to tell me when the content makes you happy or when I’ve totally missed the mark. I will send you exclusive information, offers, and surveys via email. Be honest with me. I know a lot, but I don’t know everything. I freely admit it. It is my intention to learn as much from you as you learn from me. A girl gets lonely on social media. Come chat with me. I’m on Facebook, Instagram, Pinterest, and LinkedIn. Add me everywhere. We’ll turn it into a big party. Well, that’s about it for now. I hope to hear from you soon. In the meantime, be courageous. Want to Master Your Emotions? Now You Can!